The nascent entente between Asia’s richest democracy and its largest was powerfully showcased by Japanese Prime Minister Shinzo Abe’s presence as the chief guest at India’s Jan. 26 Republic Day, just weeks after the historic Indian tour of Emperor Akihito and Empress Michiko. Abe returned home with an invitation for Japan to join Indian-sponsored naval exercises with the United States and to invest in infrastructure development in India’s sensitive northeast, a sizable slice of which China claims. The ascent of an increasingly assertive and revanchist China is beginning to trigger geopolitical realignments in Asia, in keeping with balance-of-power theory. The new bonds between a politically resurgent Japan and a strategically transforming India are an important example of this trend. A Japan-India democratic axis, with U.S. support, can potentially reshape the Asian strategic landscape and block the rise of a Sino-centric Asia. Deepening the strategic collaboration between Asia’s second- and third-biggest economies, however, must await the outcome of India’s national election by May. Like Japan before Abe’s return to power in late 2012, India currently is weighed down by its domestic politics. A rudderless India indeed is in search of its own Abe — a clearheaded, determined and dynamic leader to head its next government. 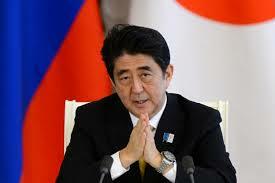 Today no other leader of a major power underlines the centrality of building strategic bonds with India as Abe does. The fact is that Japan has gone from aiding China’s economic rise through technology transfers and generous Official Development Assistance (ODA) to trying to balance China’s emergence as a military threat. Japan has emerged as India’s critical source of capital and commercial technology. India overtook China a decade ago as the largest recipient of ODA, which is currently funding more than 60 Indian projects. China has absorbed much of Japan’s emerging-market investments, but Japanese investors are now beginning to increasingly view China’s rising labor costs and political muscle-flexing as significant risks. After years of focusing on China, Japanese firms are seeking to moderate the risks by tapping the markets in India and Southeast Asia. In this context, India — with its vast domestic market and large, young and cheap labor force — is seeking to position itself as Japan’s investment partner of choice. An ongoing shift in Japanese foreign direct investment has turned Japan into India’s largest source of FDI among major industrialized nations. The number of Japanese companies operating in India has almost doubled over the past five years. Bilateral trade could reach $25 billion this year, roughly double the level four years ago, thanks to a 2011 comprehensive trade pact that aims to remove duties on most goods. India’s human capital and Japan’s financial and technological power can be a good match to propel India’s infrastructure development and great-power aspirations, as well as catalyze Japan’s revival as a world power. There is clear potential for strong synergies. Abe’s push for closer strategic bonds with India is part of his broader strategy of “proactive pacifism” to put discreet checks on any unbridled exercise of Chinese power. He, however, has had to deal with a tottering government in India. Discussions on Japan’s offer to sell its ShinMaywa US-2i amphibious search-and-rescue aircraft, for example, have made little headway, although further talks are scheduled for March. Similarly, despite the two countries forging an alliance to develop rare earths so as to reduce their dependence on China for these vital minerals, the planned joint production in India has still to begin. Toyota Tsusho completed building a rare-earths processing plant in India’s Odisha state last year but remains locked in a price dispute with the state-owned Indian Rare Earths Limited. New Delhi has eagerly sought a civilian nuclear deal with Japan, similar to the one it clinched with the U.S. in 2008. At a time when public sentiment in Japan against nuclear power is growing, the Abe administration has little incentive to conclude such an accord with a lame-duck Indian government facing an almost-certain election rout. Consequently, three rounds of talks in the past seven months have failed to produce even a draft accord. Still, the level and frequency of bilateral engagement has become extraordinary in recent years. Every year, the two countries hold a summit, several ministerial-level meetings, and a 2-plus-2 dialogue involving senior officials from their foreign and defense ministries. India holds a 2-plus-2 dialogue with no other nation and an annual summit with only one other country — Russia. In the next phase, Japan-India collaboration will likely extend to missions in space. Both India and Japan have formidable space capabilities. While Japan has sophisticated rocket and satellite capabilities for both civilian and military use, India has developed and placed in orbit Asia’s largest fleet of satellites for remote sensing and communication purposes. After its unmanned lunar mission, India, with a new Mars mission, has overtaken China’s efforts in space, with an Indian spacecraft currently on its way to the red planet. New institutional mechanisms for collaboration indicate that the role of personalities as drivers of the partnership will gradually become less important. However, if the entente is to ensure a pluralistic, stable Asian order and help transform Asian geopolitics, India and Japan need to add greater strategic and economic bulk to their ties. A Tokyo-New Delhi duet must lead the effort to build Asian power equilibrium and safeguard vital sea lanes in the wider Indo-Pacific region. Brahma Chellaney, a geostrategist, is the author, most recently, of “Water, Peace, and War” (Oxford University Press, 2014).